Tramadol, sold under the brand name Ultram among others, is an opioid pain medication used to treat moderate to moderately severe pain. When taken by mouth in an immediate-release formulation, the onset of pain relief usually begins within an hour. It is also available by injection. It may be sold in combination with paracetamol (acetaminophen) or as longer-acting formulations. Common side effects include constipation, itchiness, and nausea. Serious side effects may include seizures, increased risk of serotonin syndrome, decreased alertness, and drug addiction. A change in dosage may be recommended in those with kidney or liver problems. It is not recommended in those who are at risk of suicide or in those who are pregnant. While not recommended in women who are breastfeeding, those who take a single dose should not generally stop breastfeeding. Tramadol acts by binding to μ-opioid receptors on neurons. It is also a serotonin–norepinephrine reuptake inhibitor (SNRI). It is converted in the liver to O-desmethyltramadol, an opioid with stronger binding to the μ-opioid receptor. Tramadol was patented in 1963 and launched under the name "Tramal" in 1977 by the West German pharmaceutical company Grünenthal GmbH. In the mid-1990s, it was approved in the United Kingdom and the United States. It is available as a generic medication and marketed under many brand names worldwide. In the United States, the wholesale cost is less than US$0.05 per dose as of 2018. In 2016, it was the 39th most prescribed medication in the United States, with more than 19 million prescriptions. The risk of opioid-related adverse effects such as respiratory depression, falls, cognitive impairment and sedation is increased. The most common adverse effects of tramadol include nausea, dizziness, dry mouth, indigestion, abdominal pain, vertigo, vomiting, constipation, drowsiness, and headache. Compared to other opioids, respiratory depression and constipation are considered less of a problem with tramadol. Chronic opioid administration may induce a state of immune tolerance, although in contrast to typical opioids, it may enhance immune function. Long-term use of high doses of tramadol causes physical dependence and withdrawal syndrome. These include both symptoms typical of opioid withdrawal and those associated with serotonin–norepinephrine reuptake inhibitor withdrawal; symptoms include numbness, tingling, paresthesia, and tinnitus. Psychiatric symptoms may include hallucinations, paranoia, extreme anxiety, panic attacks, and confusion. In most cases, tramadol withdrawal will set in 12–20 hours after the last dose, but this can vary. Tramadol withdrawal typically lasts longer than that of other opioids. Seven days or more of acute withdrawal symptoms can occur as opposed to typically 3 or 4 days for other codeine analogues. Deaths with tramadol overdose have been reported and are increasing in frequency in Northern Ireland; the majority of these overdoses involves other drugs including alcohol. There were 254 tramadol-related deaths in England and Wales in 2013, and 379 in Florida in 2011. In 2011, 21,649 emergency room visits in the United States were related to tramadol. Tramadol may interact with certain antidepressants and anxiolytics (particularly selective serotonin reuptake inhibitors, serotonin–norepinephrine reuptake inhibitors, monoamine oxidase inhibitors, and tricyclic antidepressants) other opioid analgesics (pethidine, tapentadol, oxycodone, and fentanyl), dextromethorphan, certain migraine medications (triptans, ergots), certain antibiotics (namely, linezolid and isoniazid), certain herbs (e.g. St. John's wort, passiflora, etc. ), stimulants (including amphetamines, phenethylamine, and phentermine), lithium, and methylene blue, as well as numerous other therapeutic agents. As it is a substrate of CYP3A4 and CYP2D6, any agents with the ability to inhibit or induce these enzymes are likely interact with tramadol. A pressor response similar to the so-called "cheese effect" was noted in combinations of amphetamine and tramadol, which appears to cause dysfunction of or toxicity to epinephrine/norepinephrine receptors. Cyclobenzaprine, a commonly used muscle relaxant, atypical analgesic adjunct, as well as a potentiator often used with analgesics such as codeine, dihydrocodeine, hydrocodone and the like, is structurally related to the tricyclic antidepressants, so should not be used with tramadol; this is also the case for trazodone. Tramadol acts on the opioid receptors through its major active metabolite desmetramadol, which has as much as 700-fold higher affinity for the MOR relative to tramadol. Moreover, tramadol itself has been found to possess no efficacy in activating the MOR in functional activity assays, whereas desmetramadol activates the receptor with high intrinsic activity (Emax equal to that of morphine). As such, desmetramadol is exclusively responsible for the opioid effects of tramadol. 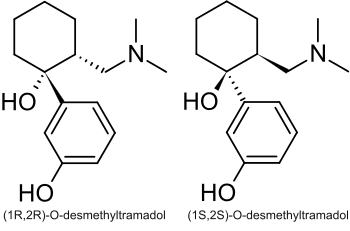 Both tramadol and desmetramadol have pronounced selectivity for the MOR over the DOR and KOR in terms of binding affinity. Tramadol is well-established as an SRI. In addition, a few studies have found that it also acts as a serotonin releasing agent (1–10 μM), similar in effect to fenfluramine. The serotonin releasing effects of tramadol could be blocked by sufficiently high concentrations of the serotonin reuptake inhibitor 6-nitroquipazine, which is in accordance with other serotonin releasing agents such as fenfluramine and MDMA. However, two more recent studies failed to find a releasing effect of tramadol at respective concentrations up to 10 and 30 μM. In addition to serotonergic activity, tramadol is also a norepinephrine reuptake inhibitor. It is not a norepinephrine releasing agent. Tramadol does not inhibit the reuptake or induce the release of dopamine. A positron emission tomography imaging study found that single oral 50-mg and 100-mg doses of tramadol to human volunteers resulted in 34.7% and 50.2% respective mean occupation of the serotonin transporter (SERT) in the thalamus. The estimated median effective dose (ED50) for SERT occupancy hence was 98.1 mg, which was associated with a plasma tramadol level of about 330 ng/ml (1,300 nM). The estimated maximum daily dosage of tramadol of 400 mg (100 mg q.i.d.) would result in as much as 78.7% occupancy of the SERT (in association with a plasma concentration of 1,220 ng/ml or 4,632 nM). This is close to that of SSRIs, which occupy the SERT by 80% or more. Peak plasma concentrations during treatment with clinical dosages of tramadol have generally been found to be in the range of 70 to 592 ng/ml (266–2,250 nM) for tramadol and 55 to 143 ng/ml (221–573 nM) for desmetramadol. The highest levels of tramadol were observed with the maximum oral daily dosage of 400 mg per day divided into one 100-mg dose every 6 hours (i.e., four 100-mg doses evenly spaced out per day). Some accumulation of tramadol occurs with chronic administration; peak plasma levels with the maximum oral daily dosage (100 mg q.i.d.) are about 16% higher and the area-under-the-curve levels 36% higher than following a single oral 100-mg dose. Positron emission tomography imaging studies have reportedly found that tramadol levels are at least four-fold higher in the brain than in plasma. Conversely, brain levels of desmetramadol "only slowly approach those in plasma". The plasma protein binding of tramadol is only 4 to 20%; hence, almost all tramadol in circulation is free, thus bioactive. Co-administration of quinidine, a potent CYP2D6 enzyme inhibitor, with tramadol, a combination which results in markedly reduced levels of desmetramadol, was found not to significantly affect the analgesic effects of tramadol in human volunteers. However, other studies have found that the analgesic effects of tramadol are significantly decreased or even absent in CYP2D6 poor metabolizers. 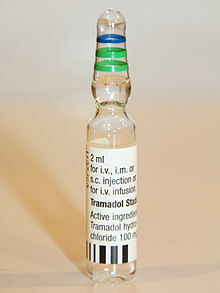 The analgesic effects of tramadol are only partially reversed by naloxone in human volunteers, hence indicating that its opioid action is unlikely the sole factor; tramadol's analgesic effects are also partially reversed by α2-adrenergic receptor antagonists such as yohimbine, the 5-HT3 receptor antagonist ondansetron, and the 5-HT7 receptor antagonists SB-269970 and SB-258719. Pharmacologically, tramadol is similar to tapentadol and methadone in that it not only binds to the MOR, but also inhibits the reuptake of serotonin and norepinephrine due to its action on the noradrenergic and serotonergic systems, such as its "atypical" opioid activity. Tramadol has inhibitory actions on the 5-HT2C receptor. Antagonism of 5-HT2C could be partially responsible for tramadol's reducing effect on depressive and obsessive–compulsive symptoms in patients with pain and co-morbid neurological illnesses. 5-HT2C blockade may also account for its lowering of the seizure threshold, as 5-HT2C knockout mice display significantly increased vulnerability to epileptic seizures, sometimes resulting in spontaneous death. However, the reduction of seizure threshold could be attributed to tramadol's putative inhibition of GABAA receptors at high doses (significant inhibition at 100 μM). In addition, desmetramadol is a high-affinity ligand of the DOR, and activation of this receptor could be involved in tramadol's ability to provoke seizures in some individuals, as DOR agonists are well known for inducing seizures. Nausea and vomiting caused by tramadol are thought to be due to activation of the 5-HT3 receptor via increased serotonin levels. In accordance, the 5-HT3 receptor antagonist metoclopramide can be used to treat tramadol-associated nausea and vomiting. Tramadol and desmetramadol themselves do not bind to the 5-HT3 receptor. Tramadol undergoes hepatic metabolism via the cytochrome P450 isozyme CYP2B6, CYP2D6, and CYP3A4, being O- and N-demethylated to five different metabolites. Of these, desmetramadol (O-desmethyltramadol) is the most significant, since it has 200 times the μ-affinity of (+)-tramadol, and furthermore has an elimination half-life of 9 hours, compared with 6 hours for tramadol itself. As with codeine, in the 6% of the population who have reduced CYP2D6 activity (hence reducing metabolism), a reduced analgesic effect is seen. Those with decreased CYP2D6 activity require a dose increase of 30% to achieve the same degree of pain relief as those with a normal level of CYP2D6 activity. Its volume of distribution is around 306 l after oral administration and 203 l after parenteral administration. Tramadol is marketed as a racemic mixture of both R- and S-stereoisomers, because the two isomers complement each other's analgesic activities. The (+)-isomer is predominantly active as an opiate with a higher affinity for the µ-opiate receptor (20 times higher affinity than the (-)-isomer). The U.S. Food and Drug Administration (FDA) approved tramadol in March 1995 and an extended-release (ER) formulation in September 2005. ER Tramadol was protected by US patents nos. 6,254,887 and 7,074,430. The FDA listed the patents' expiration as 10 May 2014. However, in August 2009, US District Court for the District of Delaware ruled the patents invalid, a decision upheld the following year by the Court of Appeals for the Federal Circuit. Manufacture and distribution of generic equivalents of Ultram ER in the United States was therefore permitted prior to the expiration of the patents. Effective August 18, 2014, tramadol has been placed into Schedule IV of the federal Controlled Substances Act in the United States. Before that, some US states had already classified tramadol as a Schedule IV controlled substance under their respective state laws. Tramadol is classified in Schedule 4 (prescription only) in Australia, rather than as a Schedule 8 Controlled Drug (Possession without authority illegal) like most other opioids. Illicit use of the drug is thought to be a major factor in the success of the Boko Haram terrorist organization. When used at higher doses, the drug "can produce similar effects to heroin." Said one former member, “whenever we took tramadol, nothing mattered to us anymore except what we were sent to do because it made us very high and very bold, it was impossible to go on a mission without taking it.” Tramadol misuse is also found as a coping mechanism in the Gaza Strip. In 2013, researchers reported that tramadol was found in relatively high concentrations (1%+) in the roots of the African pin cushion tree (Nauclea latifolia). In 2014, however, it was reported that the presence of tramadol in the tree roots was the result of tramadol having been administered to cattle by farmers in the region: tramadol and its metabolites were present in the animals' excreta, which contaminated the soil around the trees. Therefore, tramadol and its mammalian metabolites were found in tree roots in the far north of Cameroon, but not in the south where it is not administered to farm animals. ^ a b c d e f g h i j k l m n "Tramadol Hydrochloride". The American Society of Health-System Pharmacists. Retrieved 1 December 2014. ^ "Tramadol: MedlinePlus Drug Information". medlineplus.gov. ^ a b c d e Brayfield, A, ed. (13 December 2013). "Tramadol Hydrochloride". Martindale: The Complete Drug Reference. Pharmaceutical Press. Retrieved 5 April 2014. ^ a b "Ultram, Ultram ER (tramadol) dosing, indications, interactions, adverse effects, and more". Medscape Reference. WebMD. Retrieved 28 November 2013. ^ a b c "Australian Label: Tramadol Sandoz 50 mg capsules" (PDF). TGA eBusiness Services. 4 November 2011. Retrieved 6 April 2014. ^ "Tramadol Pregnancy and Breastfeeding Warnings". Drugs.com. Retrieved 5 September 2016. ^ a b c d Leppert W (November – December 2009). "Tramadol as an analgesic for mild to moderate cancer pain" (PDF). Pharmacological Reports. 61 (6): 978–92. doi:10.1016/s1734-1140(09)70159-8. PMID 20081232. ^ Fischer, Jnos; Ganellin, C. Robin (2006). Analogue-based Drug Discovery. John Wiley & Sons. p. 528. ISBN 9783527607495. ^ "FDA Drug Safety Communication: FDA evaluating the risks of using the pain medicine tramadol in children aged 17 and younger". FDA. FDA Drug Safety and Availability. Retrieved 21 September 2015. ^ Commissioner, Office of the. "Press Announcements - FDA statement from Douglas Throckmorton, M.D., deputy center director for regulatory programs, Center for Drug Evaluation and Research, on new warnings about the use of codeine and tramadol in children & nursing mothers". www.fda.gov. Retrieved 21 April 2017. ^ "FDA Drug Safety Communication: FDA restricts use of prescription codeine pain and cough medicines and tramadol pain medicines in children; recommends against use in breastfeeding women". Food and Drug Administration. ^ "Tramadol". MedlinePlus. American Society of Health-System Pharmacists. 1 September 2008. Retrieved 29 September 2009. ^ Sacerdote P, Bianchi M, Gaspani L, Manfredi B, Maucione A, Terno G, Ammatuna M, Panerai AE (2000). "The effects of tramadol and morphine on immune responses and pain after surgery in cancer patients" (PDF). Anesthesia & Analgesia. 90 (6): 1411–14. doi:10.1097/00000539-200006000-00028. PMID 10825330. ^ a b c Epstein DH, Preston KL, Jasinski DR (2006). "Abuse liability, behavioral pharmacology, and physical-dependence potential of opioids in humans and laboratory animals: lessons from tramadol". Biological Psychology. 73 (1): 90–99. doi:10.1016/j.biopsycho.2006.01.010. PMC 2943845. PMID 16497429. ^ Rodriguez RF, Bravo LE, Castro F, Montoya O, Castillo JM, Castillo MP, Daza P, Restrepo JM, Rodriguez MF (2007). "Incidence of weak opioids adverse events in the management of cancer pain: a double-blind comparative trial". Journal of Palliative Medicine. 10 (1): 56–60. doi:10.1089/jpm.2006.0117. PMID 17298254. ^ White M. "Tramadol Deaths in the United Kingdom" (pdf_e). Public Health England. ^ Fauber J (22 December 2013). "Killing Pain: Tramadol the 'Safe' Drug of Abuse". ^ Scheck J (19 October 2016). "Tramadol: The Opioid Crisis for the rest of the World". The Wall Street Journal. Dow Jones & Co. Retrieved 4 January 2019. ^ "cyclobenzaprine oral : Uses, Side Effects, Interactions, Pictures, Warnings & Dosing". WebMD. Retrieved 8 November 2016. ^ "Trazodone: Common sleep drug is little-known antidepressant". Consumer Reports. Retrieved 8 November 2016. ^ a b c d Shen Q, Qian Y, Huang X, Xu X, Li W, Liu J, Fu W (2016). "Discovery of Potent and Selective Agonists of δ Opioid Receptor by Revisiting the "Message-Address" Concept". ACS Med Chem Lett. 7 (4): 391–6. doi:10.1021/acsmedchemlett.5b00423. PMC 4834657. PMID 27096047. ^ a b c d e Potschka H, Friderichs E, Löscher W (September 2000). "Anticonvulsant and proconvulsant effects of tramadol, its enantiomers and its M1 metabolite in the rat kindling model of epilepsy". Br. J. Pharmacol. 131 (2): 203–12. doi:10.1038/sj.bjp.0703562. PMC 1572317. PMID 10991912. ^ Shiraishi M, Minami K, Uezono Y, Yanagihara N, Shigematsu A, Shibuya I (2002). "Inhibitory effects of tramadol on nicotinic acetylcholine receptors in adrenal chromaffin cells and in Xenopus oocytes expressing alpha 7 receptors". Br. J. Pharmacol. 136 (2): 207–16. doi:10.1038/sj.bjp.0704703. PMC 1573343. PMID 12010769. ^ a b Driessen B, Reimann W (January 1992). "Interaction of the central analgesic, tramadol, with the uptake and release of 5-hydroxytryptamine in the rat brain in vitro". British Journal of Pharmacology. 105 (1): 147–51. doi:10.1111/j.1476-5381.1992.tb14226.x. PMC 1908625. PMID 1596676. ^ a b c d Driessen B, Reimann W, Giertz H (1993). "Effects of the central analgesic tramadol on the uptake and release of noradrenaline and dopamine in vitro". Br. J. Pharmacol. 108 (3): 806–11. doi:10.1111/j.1476-5381.1993.tb12882.x. PMC 1908052. PMID 8467366. 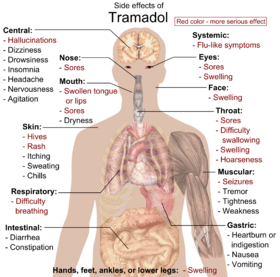 ^ "Tramadol Dosage Guide with Precautions". ^ Yanarates O, Dogrul A, Yildirim V, Sahin A, Sizlan A, Seyrek M, Akgül O, Kozak O, Kurt E, Aypar U (2010). "Spinal 5-HT7 receptors play an important role in the antinociceptive and antihyperalgesic effects of tramadol and its metabolite, O-Desmethyltramadol, via activation of descending serotonergic pathways" (PDF). Anesthesiology. 112 (3): 696–710. doi:10.1097/ALN.0b013e3181cd7920. PMID 20179508. ^ Samer CF, Lorenzini KI, Rollason V, Daali Y, Desmeules JA (2013). "Applications of CYP450 testing in the clinical setting". Molecular Diagnosis & Therapy. 17 (3): 165–84. doi:10.1007/s40291-013-0028-5. PMC 3663206. PMID 23588782. ^ "Tramadol Hydrochloride 50mg Capsules". UK Electronic Medicines Compendium. January 2016. Retrieved 16 March 2017. ^ McCarberg B (2007). "Tramadol extended-release in the management of chronic pain". Therapeutics and Clinical Risk Management. 3 (3): 401–10. PMC 2386353. PMID 18488071. ^ a b FDA AccessData entry for Tramadol Hydrochloride. Retrieved 17 August 2009. ^ Purdue Pharma Prods. L.P. v. Par Pharm., Inc. , 377 Fed.Appx. 978 (Fed. Cir. 2010). ^ "DEA controls tramadol as a schedule IV controlled substance effective August 18, 2014". FDA Law Blog. 2 July 2014. ^ "Federal Registrar" (PDF). gpo.gov. ^ "Tennessee News: Tramadol and Carisoprodol Now Classified Schedule IV". National Association of Boards of Pharmacy (8 June 2011). Retrieved on 2012-12-26. ^ "State of Ohio Board of Pharmacy" (PDF). Pharmacy.ohio.gov. 18 August 2014. Archived from the original (PDF) on 29 December 2016. Retrieved 8 November 2016. ^ "Tramadol to become a Controlled Drug in the UK". vetdispense.co.uk. 2 June 2014. Retrieved 3 June 2014. ^ a b c ""If you take Tramadol away, you make Boko Haram weak."". African Arguments. 15 March 2019. Retrieved 18 March 2019. ^ "Drugs for war: Opioid abuse in West Africa". BBC News. Retrieved 18 March 2019. ^ Berger, Miriam (7 January 2019). "Gaza's Opioid Problem". ISSN 0027-8378. Retrieved 18 March 2019. ^ Barber J (2011). "Examining the use of tramadol hydrochloride as an antidepressant". Experimental and Clinical Psychopharmacology. 19 (2): 123–30. doi:10.1037/a0022721. PMID 21463069.